North Americans love eating at restaurants, and it can be a fun get together with family or friends, especially around the holiday season. During the holiday season, people would prefer to relax and not cook. That is completely understandable, considering all of the hustle and bustle associated with the festive season. It can be a great time had by all, sharing thought-provoking conversations over drinks, and good food. But is it actually good food and do you know what you’re eating? If the restaurant is a family-owned or high-class restaurant, you have less to worry about when it comes to the quality of your food. Fast food and other restaurant chains, on the other hand, don’t particularly care about your health, as they use processed and genetically modified organisms/food (GMOs) to create the signature dishes that you love. It’s hard to always avoid GMO or processed foods when it’s not coming from your kitchen table. It can be quite confusing for the health-conscious person to pick healthy food options at certain restaurants. It’s best to order the vegetarian options at most major restaurant chains. Why? Because a lot of the factory-raised chicken or beef you will find on your plate at restaurants isn’t real food, it’s processed and contains antibiotics, steroids, and growth hormones. It’s best to stick to more of the vegetarian options on the menu; however, don’t be tricked by the veggie burger, since it likely contains GMO soy. Seafood is generally a better choice when dining out than chicken or beef. It would be best if your seafood is sustainably harvested and wild when you order. Your salad at a restaurant should still be made up of healthy food. It’s pretty trendy to order the large salad when watching your weight, or while living a consistently healthy lifestyle. However, not all salads are good for your health. For salads, the greener, the better. I often pick spinach or kale salads if they are a menu option. They are both excellent sources of vitamins A, C, E, K, B vitamins, and various minerals. Iceberg lettuce and romaine lettuce have similar nutrients, however you receive more nutrients in the darker greens. Try and add healthy foods such as nuts, berries, and avocados to make your salad even healthier. You may have dressed to impress; however, when it comes to the food in the restaurant, it might be wise to dress down. When it comes to salads, avoid creamy dressings and processed meat toppings such as bacon bits. Ask your server to bring you olive oil and balsamic vinegar, which you can add to your salad yourself and control the portion. It gives a personal touch to an otherwise man-made meal. When you order sandwiches at a restaurant, consider getting dressings on the side. This way you control your meal, and how many calories, fat, and sugar you are putting into your body. A common trend between most fast food and restaurant chains is to serve carbonated beverages with your meal. This is a double-whammy when it comes to being wrong for your health. Carbonated and sugary drinks are loaded with chemicals such as fluoride and chlorine. Aspartame and caffeine are also known to lead to disease when added to soft drinks. The best option for a healthy eating plan is to drink less than a cup of water, before or after your meal. This way, the water will help stimulate the digestive juices in your body. When you order your meal, it is a good idea to ask for triple the veggies you would normally receive on your plate. Some restaurants only provide veggies as a garnish, where adding more fresh vegetables helps you get more healthy food onto your plate. Food preparation is also important when dining at restaurants. Ask your server how your food is prepared. It is best for your healthy food to be steamed, baked, or grilled. Cooking methods such as using the microwave or boiling decrease the nutrients within the healthy food. Before you attend the restaurant, check online, not just to see what you’re going to order, but also what you won’t order. Stealth Health, “Eat Smart When Dining Out: 20 Tips,” Reader’s Digest web site; http://www.rd.com/health/healthy-eating/eat-smart-when-dining-out-20-tips/2/. Pearson, L., Smith, M., “How to eat healthy when dining out,” Canadian Living magazine web site; http://www.canadianliving.com/health/nutrition/how_to_eat_healthy_when_dining_out.php. 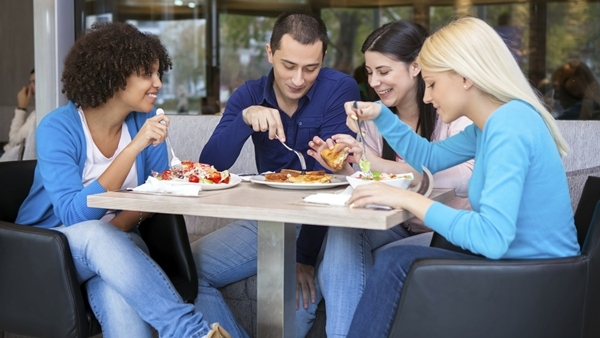 “Top 10 tips for eating out,” EatRight Ontario web site; https://www.eatrightontario.ca/en/Articles/Dining-Out/Top-10-tips-for-eating-out. “Healthy Fast Food: Tips for Making Healthier Fast Food Choices,” HelpGuide.org web site; http://www.helpguide.org/life/fast_food_nutrition.htm. “How to Eat Out (with a Real Food Spin),” Holistic Squid web site; http://holisticsquid.com/how-to-eat-out/. Jegtvig, S., “What is the Nutritional Value of Iceberg and Romaine Lettuce?” About.com web; http://nutrition.about.com/od/askyournutritionist/f/lettuce_info.htm.